Imagine a pie, infinitely sliced as shown. 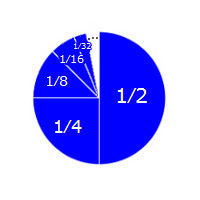 The first slice is half of the pie, the second a quarter, the third an eighth, and so on, without end. Here too the sum increases endlessly but the result is obviously correct. So, amazingly, an infinity of positive numbers can sum to a finite quantity. But this is not always true and, indeed, the result of an infinite sum is not always predictable. We can’t prove this (well-known) result here, but such infinite sums have been investigated by mathematicians for centuries, with the full fruit of their labours being realized only in 19th century Europe. To reach the doorway, Achilles must undertake an infinite sequence of movements. Each movement will occupy some of his time. But it does not follow that, to complete the undertaking, Achilles requires an infinite amount of time. But we saw that this is wrong; the correct sum is actually 1. Indeed, in our example, Achilles stands one meter from the doorway and walks at one meter per second. So we would expect him to take one second to reach the doorway. The correct infinite sum fully bears this out. The question now is whether this resolves the paradox.